A couple of weeks ago, I received a pretty tempting invite – to fly with a few other writers up to the Okanagan Valley for the day to visit, tour and taste at Oliver’s Hester Creek Estate Winery. It’s not often that offers like that come along, so I jumped at the chance. I thought it would be great to check out the new winery they had built and to taste the wines they’ve been turning out. Hester Creek has an interesting story. The winery’s 75 acres is located on the Golden Mile near Oliver, where hot days and cool nights present almost perfect growing conditions for grapes. It was Joe Busnardo, an Italian immigrant who first planted grapes on the site 1968. Oddly enough, he chose Trebbiano as the first varietal to go into the ground – and some of those original plantings are still around in the winery’s vineyard. They’re thick and gnarled, but turn out a surprisingly tasty wine (more on that in a bit). 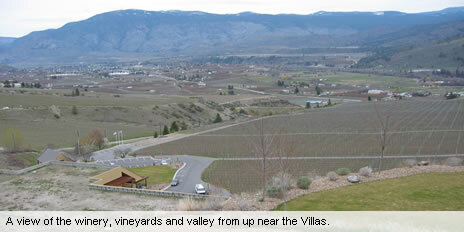 Joe sold the winery in 1996 and relocated the Divino Estate Winery to the Cowichan Valley on Vancouver Island. 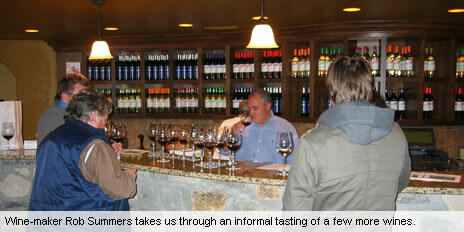 From 1996 to 2002, the winery was owned by a local group, headed by winemaker Frank Supernak. They renamed the winery after a creek flowing on the border of the winery’s land. The vineyards had been left in pretty rough shape, but the group did its best over the next 6 years to make a go of it. Unfortunately, they ran out of money and the winery ended up in receivership. Quite the tale for such a good piece of land. To make a relatively long story a bit shorter, in 2004 the winery was acquired while in receivership by BC businessman, Curt Garland – and the turnaround began. 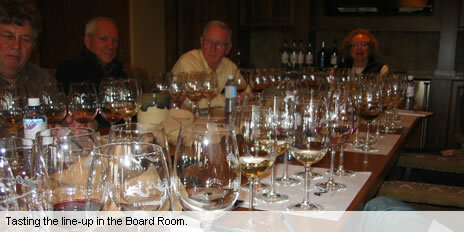 Mr. Garland set about making the winery live up to its potential. He hired wine-maker Rob Summers in 2006, planted new vines in the vineyards, replaced old overhead systems with drip irrigation, constructed a new winery building and tasting room and really rounded out the project by building B&B style villas on the hill overlooking the winery and vineyards. The place is pretty state-of-the-art… and beautiful. 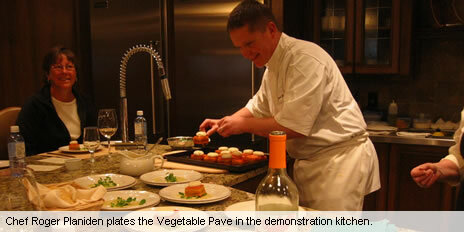 We ate a beautiful Vegetable Pave (paired with the 2008 Pinot Gris), crafted by Chef Roger Planiden in their modern demonstration kitchen. This was built to hold cooking classes and small events at the winery. We then moved to their dining room, where we had an incredibly tasty meal of prosciutto-wrapped chicken in a blackberry reduction. Dessert was a delicious Chocolate Crème Brûlée with berries. After the more formal tasting in the Board Room, a few of us were joined by wine-maker, Rob Summers at the counter in the tasting room. He started opening bottles (and boxes) for us to try. He’s an enthusiastic guy – and that rubs off. He wanted to share with us what he had been up to at the winery. It was cool to taste the difference between the 2005 Reserve Cabernet Sauvignon, made by wine-making consultant Eric von Krosigk and the 2006, made by Rob. The 2005 was extremely vegetal. The 2006 had a much fruitier edge. Having said that, they’ll no longer be making a single-varietal Cabernet Sauvignon. Instead, those grapes will be used for blending. All in all, I was quite impressed. 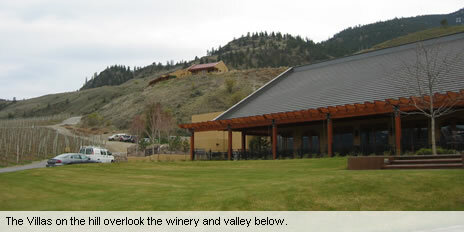 It had been years since I had tried a wine from Hester Creek – and there was a reason for that. I hadn’t liked the wine that had come from there. Not so any more. With the new facilities and plantings, it’s now up to the wine-making team to run with it and show what they can do. Fortunately, from what I tasted, they’re well on their way. If what they’re trying to do is position themselves as a value winery with approachable wines for the everyday consumer, I’d have to say that they’re hitting the mark. The wines are not necessarily ones that you would choose to sit in your cellar, but they are very affordable and approachable wines to drink today. They definitely sit on some good land and from what I heard last Wednesday, could be aiming at the higher market some time in the near future with a smaller production Reserve wine… and let’s hope that wine-maker Rob Summers makes that happen. It would be fun to see what they could do with the resources they have.